I’m a tennis fanatic. I’ve walloped forehands and smashed volleys for 21 years. Watched Ivan Lendl and Stefan Edberg “Live at the Araneta Coliseum.” Saw Carlos Moya at the 2003 Thailand Open. I’ve never missed a tennis grand slam watch on Star Sports. Read 112 issues of Tennis magazine and gobbled up autobiographies of John McEnroe and Boris Becker. I am, as I said, a tennis freak. But nothing, I’m sure, will compare to my excitement one week from today (Thursday, Nov. 22) when my eyeballs will pop out of the sockets of my eyes. 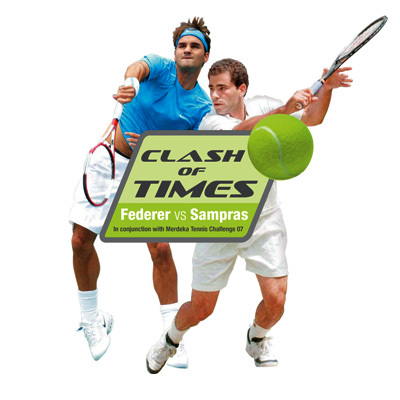 It’s Roger Federer vs. Pete Sampras! The two greatest players who’ve ever held a racket will play an exhibition match in Kuala Lumpur, Malaysia. Best of all, I’ll be there. Sampras had always been my favorite. His smooth serve-and-volley style. His seven Wimbledon crowns. His running forehand. His vomiting spell against Alex Corretja at the 1996 U.S. Open. His crying episode at the ’95 Australian Open. His unrivaled rivalry against Andre Agassi. What a career. And, to top it all, what a person. Never one to complain, he never screamed like Jimmy Connors or partied after work like Becker. He was methodical, focused, a gentleman, and yes, to many, boring. But how can critics label an athlete “boring” when he wins 14 major titles? 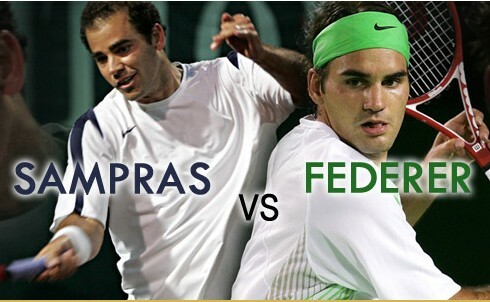 So Sampras, all of 36 years old, is playing Federer, 26. Does Pete stand a chance? He’s been gone for five years while Federer’s been No.1 for, what, 10,539 weeks? Isn’t this a lopsided match? Maybe. But that’s not the point. To start with, it’s an exhibition. So I’m sure they’ll relax, laugh, high-five, maybe Roger will shout a few jokes about Pete’s receding hairline, maybe Pete will joke about Roger’s increasingly-plump girlfriend (that’s a joke!). The point is you’ve got the No.1 and No.1 best-evers on display. Federer admits that Sampras is the best ever… for now. 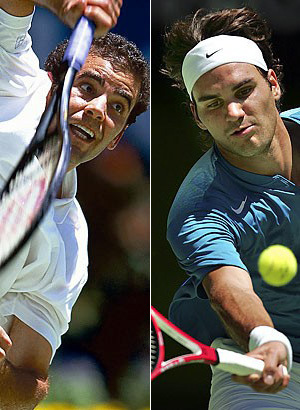 Sampras says that Federer will be the best-ever… soon. How good a pairing can it get? Back to the can-Sampras-compete question: I think he can. Against his contemporaries (Jim Courier and Todd Martin), he’s almost never lost in their seniors tour this year. Plus, knowing how competitive he is, he’s been practicing for 14 hours daily. 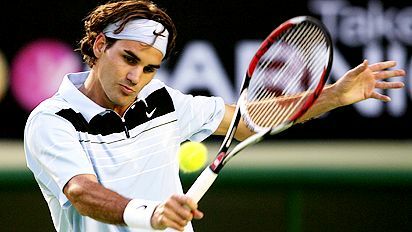 And, he still possesses a lethal serve-and-volley game—a style that’s rare to find in today’s game, a tactic that will trouble Federer. That’s not all. 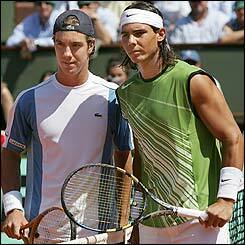 Two days earlier, this Tuesday (Nov. 20), it’s Rafael Nadal vs. Richard Gasquet—the world’s no.2 and no.8. They’ll play in the same 12,000-seater Malawati Stadium. To top it all, next week is the Malaysia Open. So apart from the two matches, there’ll be other netters hitting the yellow ball and, on the side, climbing the Petronas Towers. And—lest you believe only sportswriters will fly across the South China Sea to watch tennis—Lifestyle section writer Chinggay Utzurrum and Sun.Star Cebu’s Managing Editor (and Opinion columnist) Michelle So will be there. Live. In person. With the same pair of eyeballs popping out of their eyes’ sockets. How excited are Chinggay and Michelle to see Roger? Michelle, in an e-mail sent yesterday, will prepare a banner that reads, “FEDERER, WE LOVE YOU!! !” while Chinggay will buy night binoculars to better see the “Swiss Chocolate” from the stands. Would you believe that! So if this gets shown on ESPN and you see some hilarious-looking spectators screaming while waving Roger streamers, now you know: Bisaya na sila! thanks to your site 🙂 i frequently lurk here cos i like everything about sports. and your page just makes it more interesting and more fascinating.! and since you too are coming to the merdeka XO match, i hope by any chance bump on you and see the writer behind this awesome page 🙂 cheers! Thanks so much for the greeting!!! HI Robert! Unfortunately, I wasn’t able to visit the Malaysia Open. Just came to KL to watch the Nadal-Gasquet and Sampras-Federer matches. Hope our very own Mamiit won… thanks!